Cultivating vegetables for profit can be a very attractive engagement as there are many options of crops at your disposal but few stands in the way of hot pepper. One of the few factors that determine the profitability of cultivating any crop is the demand which is directly connected to the consumer base. Pepper surely has a very wide consumer base no doubt and this makes it a very attractive choice. Nevertheless, as it is with many vegetable crop farming, cultivating pepper whether on commercial scale or otherwise comes with challenges. There are two major types of hot pepper: habanero and chili. Your choice should be market driven. Going by my location, the former sells faster than the latter but this may not be applicable in your case. I would be enlightening you on the steps you need to take to make farming pepper a huge success. Field preparation can take place simultaneously with nursery establishment since it is expected of nursery care to take 3 to 4 weeks period. Soil type is usually sandy loamy but not soggy soil with a pH range of 6-7. The forms of bed to be made depend on the season and irrigation method you intend to use. The rule of thumb is that you use high bed during wet season and a bit of low beds during dry season. Make sure the soil is well worked to enable ease of root penetration. You may want to mix the soil with adequate quantity of manure and compost before transplanting. - Seed procurement: Procure seeds from reliable sources mainly based on recommendation from people who have planted similar varieties in your geographical location. The use of good viable Open pollinated seeds and or heirloom pepper is also an option but do note that, choosing a good cultivar would ensure resistance to diseases and good yield. In addition, there are numerous cultivars of hot pepper going by sizes, shapes, colour and hotness (heat); your choice must be guided by market sentiment. In my locality, local retailers and consumers believe that small sized habanero is more hot and poignant than the bigger type. - Nursery type: You can decide to raise your nursery on seed beds, nursery trays, cups or nursery bags. For the seed beds, ensures that the seeds are well spaced on the shallow seed rows and lightly cover with soil. As for the nursery bags, seeds trays and nursery cups, plant one seed per hole or container. Make sure the soil is continuously moist but not waterlogged during the period before germination. Germination starts between 7 to 12 days after sowing the seeds. Ensure you properly cover the nursery from the direct sunlight to prevent scorching by the sun which may cause seedlings’ death. - Grow medium: As for the seed beds, it is vital you enrich the soil with old or industrial manure, compost in order to supply essential nutrients to the seedlings and give them good start in life. As for the seedling trays, use quality coco peat while the nursery cup or bag should also contain rich soil with a lot of old manure. Read our article on Tomato Nursery Care (Tomato and pepper nursery care and cultivation have a lot of similarity since they both belong to solanaceous family). - Soil drench: You may want to apply fungicide as soil drench to prevent damping off and also as folia spray (Active ingredients: metalaxyl and or macozeb) after two weeks especially during wet season. - Liquid fertilizer: You may also decide to apply folia fertilizer to supply essential micro-nutrients after two weeks of germination. - Net house: It is essential to put your nursery into one form of net house or the other to prevent attacks from insect especially leaves feeders and cutworms. - Hardening: Hardening of seedlings should be done few days before transplanting. This is a process of exposing seedlings gradually to direct sunlight in order to enable them to acclimatize to life on the field beforehand. Transplanting of seedlings would take place after the seedlings spend 3 to 4 weeks in the nursery (at 5 true leaf stage). Ensure that transplanting takes place toward evening except on a cloudy day. The soil on the field should be well soaked with water on the day of transplanting and should be adequately irrigated or well moist for the first to second week after transplanting. All the seedlings may not have the same vigor therefore, choose only seedlings with strong vigor first. Ideal spacing for pepper is around 60cm x 45cm double rows per bed while the inter-bed spacing should be around 100cm to ensure adequate ventilation and also ease working the farm. The available resources, time of the year, soil type among others determine the irrigation method to be adopted. You may need to visit a farm that uses irrigation or talk to irrigation expert to know the best option that fit your farm type. In any case, make sure the soil is continuously moist but not waterlogged. At no point in dry season should the soil remains continuously dry which often results to the crop undergoing water stress. Also remember that aerial form of irrigation is not a preferable option for pepper. Allowing the crop’s leaves to be wet continuously encourages fungi and bacterial infestation. Peppers are generally warm season loving plant. 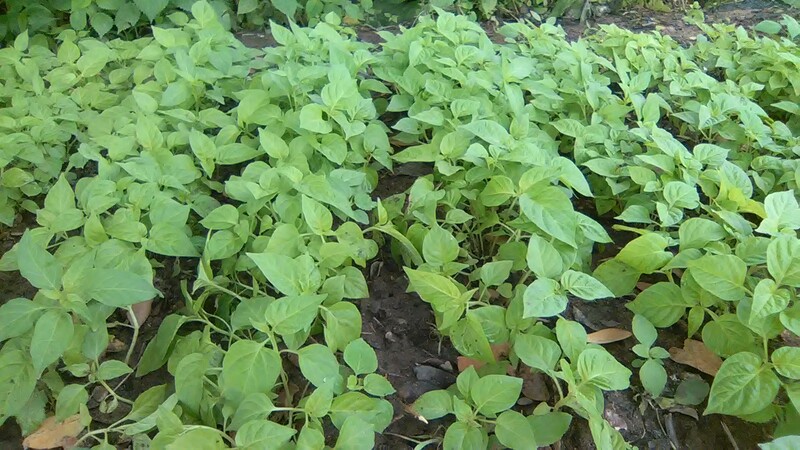 An acre of pepper could fetch you Hundreds of Thousands of Naira net profit and harvesting occurs every 5 days that ensures that you secure regular income for a considerable period of time. In addition, pepper is an indeterminate therefore has potential to fruit for a long period of time. In Part 2 of this article, you would learn about the application protocol, modern practices, harvesting and packaging and market analysis which are the key pointers to successful outcome in this engagement.